We all pay for our phones. And, boy, do we pay. But in the not so distant past, there was a special type of phone called a pay phone. These phones were coin-operated: you put your dime or quarter or dimes and quarters in the appropriate slot, and dialed. A telephone card or a credit or debit card worked, too. These phones were everywhere – airports, train stations, and bus stops. On street corners they were housed in phone booths, making them the perfect place for Clark Kent to change into Superman. Well, their time has passed. Yes, they’re still around, but their number is not even close to their peak when there were over two million in service as recently as the turn of the century, that’s this century, sixteen years ago. Today, the number is just a quarter of a million. An article in the San Diego Union Tribune this past Sunday brought on this nostalgia. When I was at AT&T, a colleague of mine was responsible for creating awareness of pay phones, and I think of her often. Billboards in airports across the country announced their availability. 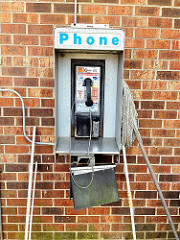 AT&T got out of the business in 2009, canceling their pay phone contracts and disconnecting service. Thank goodness for cell phones, no matter how much they cost. Filed under Odds & Ends.